Goddamn! This is one intense issue. 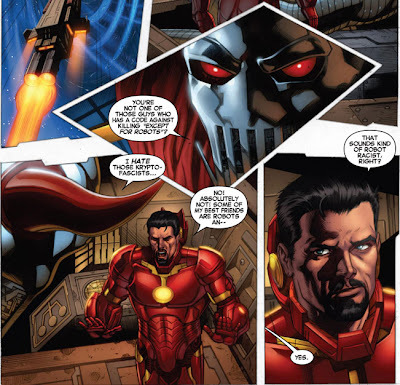 One of the most important storytelling elements in superhero comics is putting the hero up against a credible threat. The creators need to make the reader believe that the villain might triumph. That has been a strong point of the Superior Spider-Man, but this issue takes it to an entirely different level. Peter Parker and Doc Ock revealing their inner Spider-Men makes for a great visual. 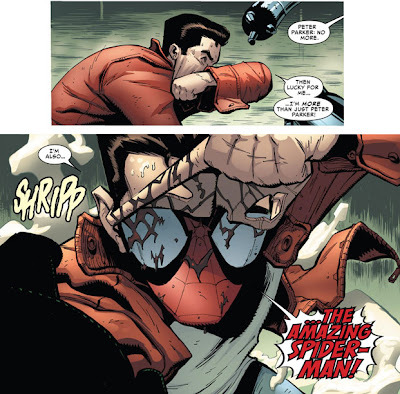 The premise of Superior Spider-Man is still off-putting, but there is an interesting story to tell here. Once again I find myself asking the question, "Why am I buying this comic?" At this point I might as well see the story through to the end, even if the plot is barely paper thin. Not even the art can save this book as it is nothing special and the lackluster set-ups don't even result in remotely interesting fights. Overall this issue is just another mediocre entry in this horribly decompressed event. After a rather disappointing first issue, I was trying to give this one a fair shake. That's not going to happen when the first 2 pages of a 22 page comic that costs $4 is completely wasted. The story told in those remaining 20 pages is an unnecessary mess. There is no need to revisit and muck up Thanos' origin. I've never been a fan of Bianchi's art. This comic is pretty damn bad and Marvel would've been better off just reprinting old stories if they really wanted to push Thanos for movie appearances. By the grace of some god Greg Land doesn't have art duties for this issue, so that's a plus. However there is the banner of "The Secret Origin of Tony Stark" as well, which fills me with a sense if dread. For the most part the comic plays to its strengths, no Land, and my tastes: robot space bounty hunters. Eaglesham's art isn't anything groundbreaking. He draws a pretty great Death's Head though, and the panel bordering is neat. This issue is an entirely serviceable story that tickles my fancy. Until the end that is, when that whole "Secret Origin" bit rears its ugly head. Hopefully my faith in Gillen is well placed and this will all turn out to be a clever ruse. A story within a story is the premise of this one, and it all got very meta very quickly. Lemire explores Animal Man's loss by examining his drive to be a hero while critiquing the fame for fame's sake reality television stars that dominate real-world entertainment. The heavily inked art of the "fictional story" was well done and differed from the series' stylistic tone enough to stand out, yet not too much to be jarring. There are stronger Animal Man issues out there, but one small road bump isn't too bad in the grand scheme of things as long as the entire story pulls together. There are a lot of moving pieces and most of them are still being set up. 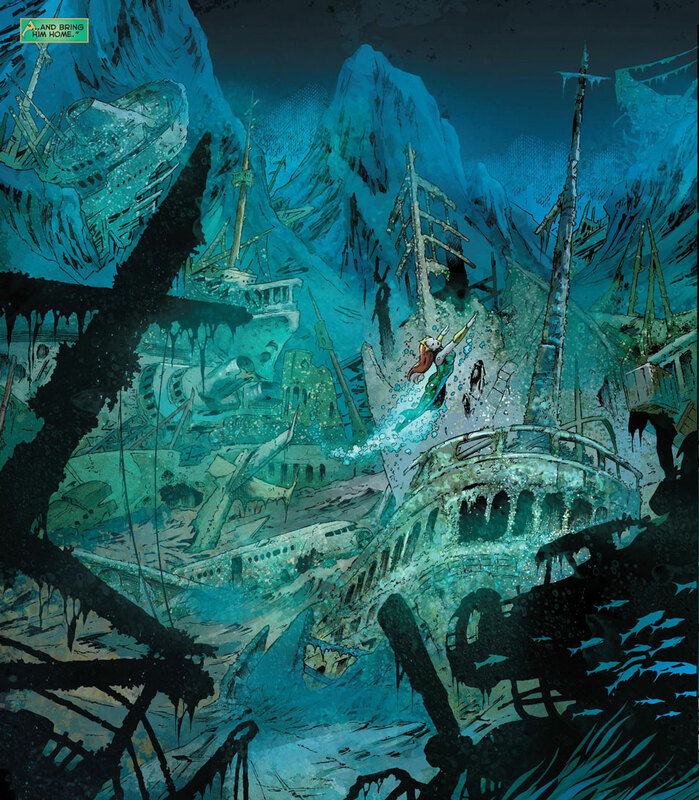 As "villainous" Ocean Master's actions were during the Throne of Atlantis crossover, his point about perspective and his actions merely being retaliatory are poignant. It rings especially true because the majority of the time people are just straight up dicks to Aquaman. The selling point of the book is the art. Every underwater panel is a sight to behold as it captures the scope and subtleties of the ocean. Also, Atlantean organ theft. Full disclosure: this is only the second issue of Stormwatch I've ever read (the first being #19). Jim Starlin taking over writing duties is what drew me in. The story is a bit confusing, but that is probably a symptom of my neophyte Stormwatcher status. 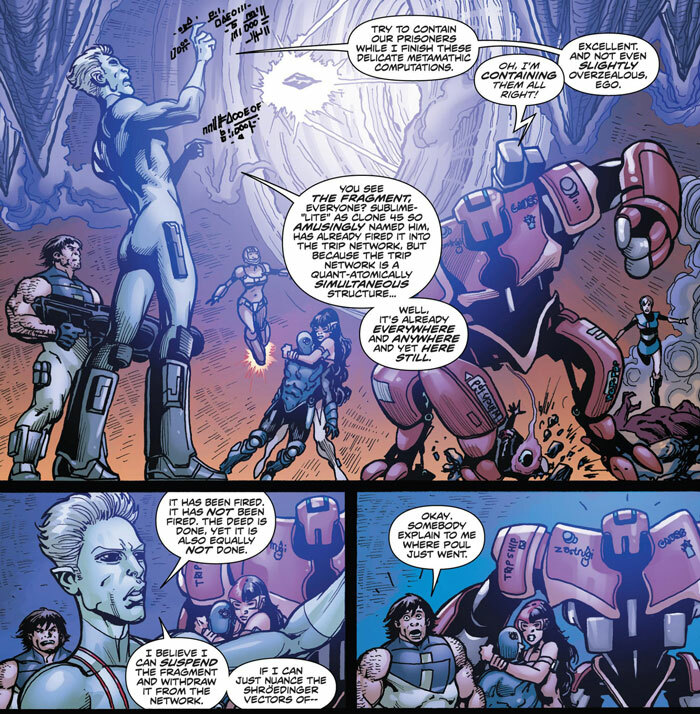 Proving that I am an equal opportunity hater of retooled origins, Lobo's new backstory is wack. Sorry Starlin, just because Aaron messed up Thanos' origins doesn't mean you can screw with one of the greatest DC characters of all time. As you can see below, one alien gets its head kicked clean off while on the opposite page one gets punched straight through its chest. Stormwatch #21 is a confirmed purchase. It's hard to live up to Grant Morrison's recently finished run on Action Comics (it concluded with #18). Unsurprisingly, this issue fails to meet that lofty standard. That's not to say this is a bad comic. Coupled with the tumultuous situation with the creative team due to Diggle's premature departure means that this issue isn't as good as this series can and should be, at least from a writing standpoint. Thankfully the book is still visually appealing. This comic is at the bottom of my reading list because it never disappoints. 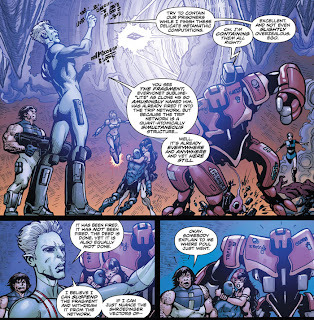 Hypernaturals continues to be a rock solid engaging tale of heroes protecting all of known space. The current plot threads all seem to be coming to a climax and that invariably means things get crazy. High concept deicide levels of crazy. Though the art sometimes falls a bit flat during more mundane scenes it is consistent and performs beautifully once the action starts. If big heroes fighting big threats is your thing, do yourself a favor and catch up on this book.